Adobe Lightroom is undoubtedly one of the most powerful tools for post-production of photos. It also does a very good job of keeping images organized and everything where it should be for easy access. That is, as long as it is used properly. One aspect of Lightroom's organizational structure is Collections. There are two types of Collections: regular Collections and Smart Collections. This article will focus primarily on Smart Collections. What they are, how they differ from regular Collections, and how you can use them to manage your images. It is important to note that as of the writing of this article, we have two different desktop versions of Lightroom: Lightroom Classic and Lightroom CC. There is also a mobile version of Lightroom CC. Lightroom CC is the “new” Lightroom and works much differently than the Classic version. The Collections feature found in the Classic version of Lightroom has been renamed “Albums” in the desktop and mobile versions of Lightroom CC. The basic functionality and purpose of the two is the same. On the other hand, Smart Collections are not available in Lightroom CC. Maybe Adobe will add something similar in the future; maybe not. For clarification, the following discussion about Collections and Smart Collections is as these features pertain to the current Lightroom Classic version. Things could change if and when Adobe phases out the Classic version and Lightroom CC is refined. Lightroom Classic users are most likely familiar with the left side panels of the software's interface. That is where the Catalog dialog is located, as well as the Folder structure indicating where your photos are located on the computer. This is also where the Collections panel lives. Collections are simply a place that you can populate with whatever images you choose. Think of a Collection as a playlist for your images. You can have as many Collections as you want and place an image into as many Collections as you want. Just remember that placing an image into a Collection does not move the image file and it is not copied. The image file remains where it was originally imported. One way that I use this feature is to create a new Top Ten Candidate Collection each year. Throughout the year, I place my favorite (or best) images into this Collection. At the end of the year, I have a much smaller number of images to go through to decide on a top ten than if I had to scour all images created the entire year. Click on the ‘Plus' symbol in the Collections Panel to create a new Smart Collection. How are Smart Collections Different? Smart Collections function in some of the same ways as regular Collections, in that they are a place to collect images and the actual image files are not moved or copied. The main difference is how the images get into a Smart Collection. For regular Collections, you actually drag an image or select it and place it into the Collection. Any image can be placed into a regular Collection, regardless of the image attributes. A Smart Collection is a bit different. There is a set of ‘rules' that are applied to tell Lightroom which images you want in a Smart Collection. The rules can be anything, from the date of capture, images with a 5-star rating, or images with a particular keyword. The possibilities are endless. If an image does not meet all the rules, it cannot be in the Smart Collection. For instance, if I have a Smart Collection for all images with a 4-star rating and above, Lightroom will not allow me to drag a 3-star rated photo into that Smart Collection. The only way to place that image into the Smart Collection would be to either change the rule or change the rating for the image. Smart Collection setup. 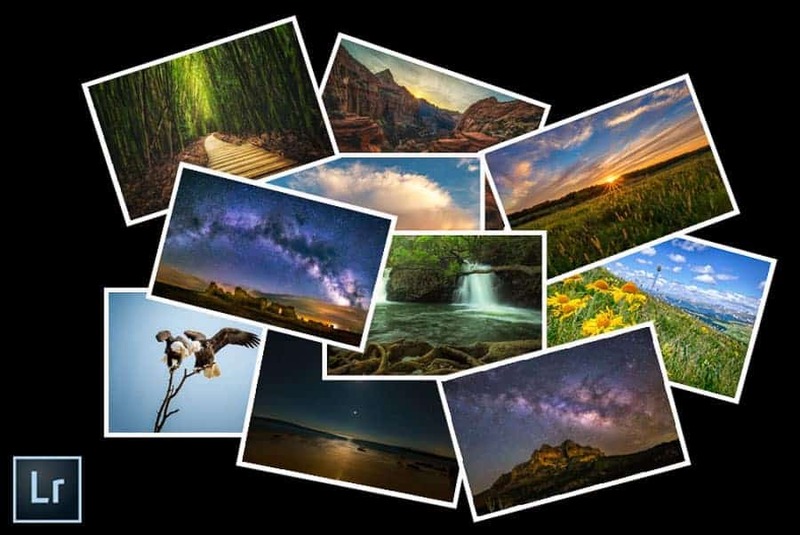 For this Smart Collection, I used a 4-star rating or higher and all images created this year to sort out the images that I want in the collection. Now that we know what Smart Collections are and how they work, let's take a look at how to create them. First of all, even if you have never created any Smart Collections, you'll notice there are 6 that are included in Lightroom by default. Look under the Collections tab on the left side of the screen and you will see Smart Collections item with the 6 choices revealed by clicking on the little triangle. Whether you realized it or not, any images in your Catalog meeting the specific criteria were being placed into one or more of these Smart Collections all along. If you wanted, the existing Smart Collections could be modified by right-clicking on one and selecting Edit Smart Collection. Within the dialog window that comes up, you can change the rule or add another one to suit your needs. The very first default Smart Collection is labeled “Colored Red”. That means that any image labeled with red flag will be automatically added to that Smart Collection. You could change that color label in the edit dialog, or you could create a new Smart Collection. Creating a new Smart Collection is easy. Either click on the little ‘+' symbol to the right of Collections or right-click on any existing collection below. Then select the Create Smart Collection option. 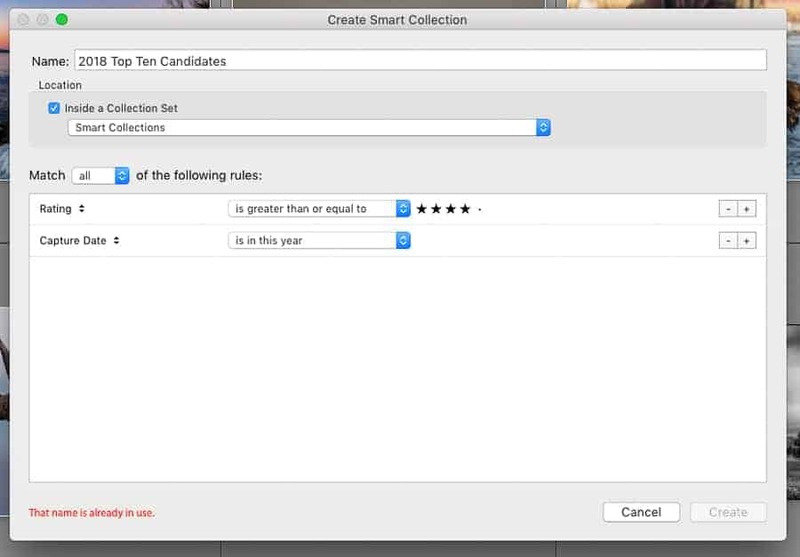 The window that pops up is where you can name your Smart Collection and assign the rules you want to apply. The default rule is Rating, but clicking the small down arrow next to it will show you tons of other options. If you want to set more than one rule to apply, click on the ‘+' on the right side. You can set as many rules as you want to really hone in on the images you want to be collected. My new 2018 Top Ten Candidates Smart Collection. The rest of these are the defaults in Lightroom. Looks like I missed keywording a few images! With all the recent changes to Lightroom, it's hard to say if the Classic version that we all know will even exist in another year or two. It's also hard to know if Adobe will include any kind of Smart Collection feature in the new Lightroom CC. With the implementation and further development of AI, I kind of doubt it. Maybe eventually the new Lightroom CC will know which images we want grouped together before we do. For those of us who continue to use the old Lightroom – which is probably most Lightroom users at this point – Smart Collections are still a very useful and capable tool. There are so many ways to use Smart Collections. If you wanted to see what images you have edited recently, you could just click on the Recently Modified Smart Collection. The default is images modified in the last 2 days, but you could change that to any time you would like. Any images edited within the date range you specify will automatically show up in that Smart Collection, and you won't have to dig around in multiple folders to find them. I plan to create a Smart Collection titled “2018 Top Ten Candidates”, with a rule applied for images with a star rating greater than or equal to 4. Throughout the year, images that I really like will get a 4 or 5 star rating and will be included in that Smart Collection automatically. Sometime in December, I will look at those image and select my top ten for the year (assuming there are 10 images in there!). Keeping your photos organized and easily accessible is important. 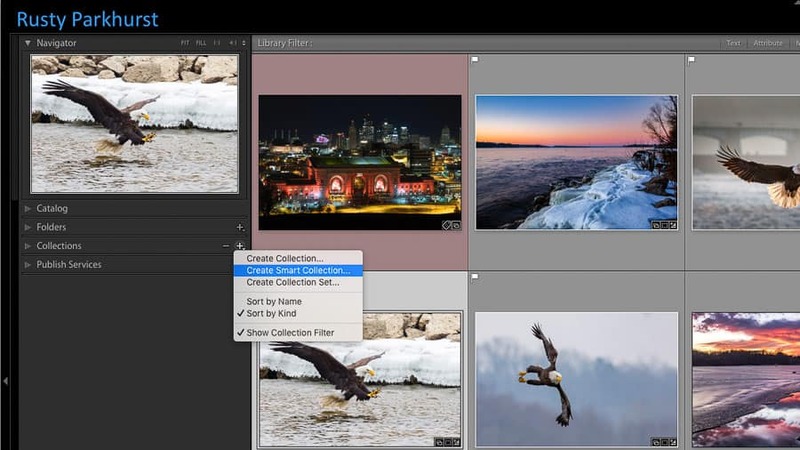 There are a number of options for organizing and managing your images within Lightroom. Smart Collections are a great alternative to just using the folder structure. You can really narrow down your images to the very best or to only the ones you want to see. There are so many possible combinations and ways to use Smart Collections, that it's not possible to cover them all in an article. Let me know in the comments below how you use Smart Collections or if you have ideas about how to use them. Rusty has been passionate about learning photography and creating great images since picking up his first 'real' camera 5 years ago. He works in the environmental consulting industry by day, spends evenings and weekends trying to keep up with 3 growing boys, and squeezes in as much photography time as possible. He loves talking photography and welcomes any questions you may have. More of his work can be found on his website.